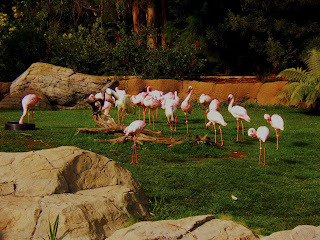 Flamingos hang out near the entrance to the Oakland Zoo. Living Social is featuring a great deal for a family of four to visit the Oakland Zoo. The deal offers a 51% discount on a one-day family pass to the zoo, covering admissions for two adults and two children for only $27. General zoo admission for one adult is $15.75, so you can see the savings this deal offers. The Oakland Zoo is smaller than the San Francisco Zoo, but is still a pleasurable outing for a family. It is located in the 525-acre Knowland Park just off highway 580 in Oakland. Currently, there are four days left to purchase the deal, which is good through August 5, 2013.